Maharashtra Government proposed a ban on the use of plastics of all sorts and thermocole items in a bid to protect the environment, granting three months time for its implementation. A very valid and welcome decision indeed. After all, we have seen the havoc caused by the uncontrolled and irresponsible use and abuse of plastics causing a threat to animals as well as the environment. The ban has officially come into force today - 23 June 2018. A hefty fine of Rs. 5000 is to be levied on anyone caught for the first time with plastic bags. A second-time offender will have to shell out Rs. 10,000 and a third-time culprit will not only become poorer by Rs. 25,000 but also have to cool his heels in prison for 3 months! Isn't that some punishment? That too when this is not recognized as a universal crime? By the way, what is the penalty for using the mobile phone while driving? 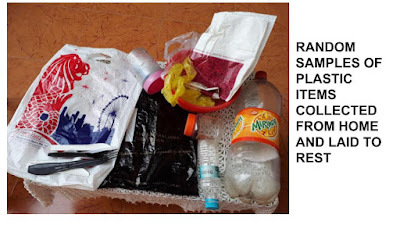 Agree that most of the countries have reduced the use of plastics and have switched over to paper / cloth items but they have allowed the ubiquitous plastic to co-exist as a minor player. Of course they are collected and recycled separately. Even international flights have not stopped using disposable cups and cutlery. Coming back to the total ban on plastics in Maharashtra, can't it be done in phases? First ban 'one-time-use' carry-bags below certain microns - these have been used for anything and everything - even to carry tea from the tea-stall to the nearby vendors! These are the main threats - quality-wise and quantity-wise. Again, has the Government really deliberated on the consequences of such a ban and identified the solutions to them? Have they proposed concrete alternatives / made alternative arrangements required on a large scale? While deliberations are going on seriously, I want to look at the situation in a lighter vein - mainly from a woman's point of view. Taking a look around my house, I can see a lot of colourful plastic baskets and bowls to hold potatoes, onions, and non-refrigerated fruits. And bottles of various sizes and shapes galore. A few curios too. Oh - what about the indispensable plastic buckets and mugs? Don't tell me we have to bid adieu to them too! Some of my friends who are socially active, have stacks of disposable glasses and dozens of forks and spoons. What happens to all these and more? Well, the authorities are not going to visit each of our houses which are our private space. So first let's deal with the bigger 'offenders' easily spotted in public places. I mean the plastic bags of all kinds. More issues - the grocer has to package his grains in biodegradable plastic bags which have shown up in the market. Take one look at the grocer's shelves - all manufactured / processed items are packaged in customized plastic packets / boxes / jars. Come to the liquids - oils, and more importantly milk that are sold in plastic pouches. What's going to be the alternative? Not to forget about the plastic bottles - the aerated drinks, even mineral water ..... Will it be going back to glass bottle days? Anyway, it's the manufacturer's headache, not mine. So why should I bother? Well, bother, I should - to an extent, on another count. What do I do with all the useful and handy plastic bottles and containers which I have been accumulating / using for storing kitchen stuff? And the small, 'fit-in-your-purse' water bottles and the big pearl pet / plastic bottles I use for storing water in the fridge and outside .... You see these 2 litre plastic bottles are great space-savers and water-holders, compared to steel utensils. Right? Well, I have to figure out what to substitute in their place. It is going to be a total make-over for my kitchen! What about yours? I can vouch for the fact that if you take a survey around any house, you will come across a lot of these handy plastic items stowed away in different parts of the house. Pull the drawers of the kitchen cabinet and plastic bottles will come tumbling out. Open the wardrobe / drawers and you will find stacks of neat plastic bags of different sizes for various uses. You'll find some even under the mattresses - just as cash was discovered by husbands during the note-ban. Some of the exclusive plastic bags (from branded stores / jewellery shops/ airports) occupy pride of place and are used for special occasions. They prove to be very handy and serve several purposes, so ladies have a tendency to collect them during their shopping sprees. When I look at my pile of treasured plastic bags, my heart bleeds. I have been flaunting a different bag each day during the past month to let the world know my shopping hot spots before I bid them a teary farewell. The pearl pet bottles and jars I had lovingly purchased, as well as the plastic ones saved after the use of packaged stuff gave me pathetic glances as I dumped them with a heavy heart in crisp plastic bags for their mass burial. Farewell, my dear 'plastics'. You have served me well. Now rest in peace to let us live in peace! Even though banning plastic is a gud decision but difficult for day to day disposal of waste till proper alternative arrangement! Considering the ill effects we have to welcome the decision taken by Maharashtra Govt. Well written ma'am as you do always!